You don't know about Danny yet. He is our son. He was born one year to the day from Kelly's birth. Days like this come around and bring us to think about life, and the path God has walked us through. Psalms 23:4 became a very real verse to me. "Even though I walk through the valley of the shadow of death, I will fear no evil for you are with me. Your rod and your staff protect and comfort me. " Here we were, walking right though the valley of death, never mind the shadow of it, and for the second time. Losing Kelly had been a hard long road but God had gifted us with extra days with her our tiny daughter and some of our grieving had been done before her death. On the way home from burying Kelly, God gave me a picture of a petit little dark haired girl, dancing before his throne. God took care of us in so many ways that summer. We had a big funeral and were blessed by many people. It took us a while to settle into a new normal. I felt lost because I *should* have been looking after a baby and didn’t know what to do now. The first while we stayed really busy because I wasn't sure how I would do if I had to be quiet all day with just Hailey and my thoughts. Sometimes when I was out some one would ask how I was and I wanted to shout, " My baby just died, how do you think I am?" I learned that God doesn't *do* this bad stuff to us, but bad stuff happens because there is sin in the world and there are things wrong with the world. God still *allowed* it to happen just as we will not always protect our children from all of life’s sorrow, bumps and bruises but He is faithful to walk with us, giving us strength and light just as we need it for the next step to carry on. Time passed and we were thrilled and a little scared to find we became pregnant very quickly again. 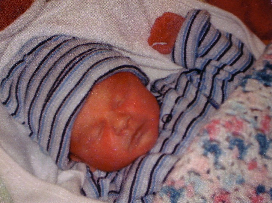 I had nightmares at first of having a C-section again since the first one had been quite a traumatic experience. When we had safely passed 32 weeks (the time we had Kelly) with no complications or signs of labour, I began to let my breath out. Bernard painted the baby room to surprise me and I decorated and got the room ready and meals in the freezer. I felt that in a way my grieving for Kelly would be finalized when I finally got to hold this new life in my arms. May 27 we went camping as a family. We had a wonderful afternoon and evening. I had had a rough week emotionally and had spent most of the morning crying for *no reason*. Bernard insisted that we camp close to town “just in case." I Praise God for Bernard's wisdom in that. After Hailey was in bed we stayed up and talked long into the night. One of the things we talked about that night was that we wanted to adopt sometime in the future, maybe in 10 years or so after we were done having biological children. We finally went to bed and I told Bernard that I felt so at peace and connected with him that I felt ready to have the baby. Not long later my growing discomfort prompted Bernard to pack Hailey and I into the car and drive very fast to the hospital. By the time we got there, the pain was unbearable. No one told us anything but they rushed us into the OR for another emergency C-section. Mercifully this time I was put under. Bernard had to wait in the hall because we had Hailey with us. He called a friend who came right away to get her for us. A year earlier, when I got to the hospital with Kelly, all the doctors and nurses kept telling me that everything was going to be fine. This time no one said we were going to be okay. I think that was maybe the worst part of it all. The very first thing I can remember, before I could even see, was the doctor telling me that we had a boy and that he didn't live, and that I would never have any more children. I wanted to close my eyes and never wake up. For weeks I felt like I just went to sleep and had a nightmare and woke up with a really bad stomach ache. They explained to us that my uterus had ruptured and I had been bleeding internally. That was what had caused the pain and killed our baby boy. He would have been a big boy they said, since he was 5, 12 with 5 weeks left to grow. We named him Daniel Bernard Joseph McKay after his Daddy, Grandpa, and Great Grandad. We couldn't bear to have a big funeral again. Bernard dug the hole himself and we buried him with Kelly and had a simple family service. Mr. Kennedy built a beautiful wooden box for him as he had for Kelly and we wrapped him in his special blankets from his Grannies. We couldn't even cry, the shock was so much. Each of our moms stayed for a week to look after us. I felt like I wanted to scream and cry but I was afraid that if I *let go* I would *lose it* somehow. Bernard felt numb. Grieving Danny was a lot harder than with Kelly. We felt like we had already been through enough and come through the test faithful. One friend that came to visit reminded me that God is big enough to handle my whys. What I struggled with even more than losing Danny was losing the hope of ever having more children. I LOVED being pregnant and nursing. Why would God do this to us after growing the desire in our hearts to have a bigger family? Our plans are nothing compared to his though. We often wonder to ourselves WHAT God must have in store for us that we have been prepared and strengthened for through this. Although we had already desired to adopt we had thought it would be down the road a bit. Maybe the time was sooner then we thought. We didn't even have to think about it for long as we strongly felt this was our next step, not to replace Kelly or Daniel but to add children to our family. We applied to an agency two months after Daniel's birth and 3 months from our application, we were holding our new son Riley in our arms. Riley was born in our hearts in South Carolina. He was only a day and a half when we first held him and I began nursing him! We named him Riley because we like the name (it means warrior), Joshua is after the Joshua in the Bible (as for me and my house we will serve the Lord), and Anthony was a name that we allowed the birth parents to choose for him. What a blessing Riley has been to us and what a healing balm as well. Some people asked if it felt different to have an adopted child. It takes a week or so to get used to, just like giving birth to a child but after that it felt more real and natural than you could imagine. Bernard says I'm spoiling him already! I'll have to watch that! Hailey adores him. We explained to her that Riley has a tummy mommy that couldn't take care of him and so we get to be his forever mommy and daddy. God is still good. Riley has been quite a challenge for us as he was very colicky the first four months due to tummy aches and itchy skin. But I don't think you have ever met anyone so thankful (even if blurry eyed) to be up in the night with a crying baby, as we were. So that brings us back to this week. On Saturday the gravestone was finally installed at the cemetery. It has both Kelly and Danny’s names on it, and two dragonflies, signifying the new life they have now in heaven. We went as a family and made our "remembering garden." We planted a lilac bush, and put a nice edge around and lots of those white rocks. Today, Hailey (now 3 1/2) and I made cupcakes for the babies’ birthdays. When Daddy got home we went to the cemetery to water the "remembering garden" and Hailey let go of two balloons (one pink and one blue) and we sent them to heaven for their birthdays. And so we celebrate life instead of mourning death. Yes, the tears still overflowed when the lady at the balloon store asked what they were for. But that's okay. Still I would never give up being pregnant with our babies if I could give up the pain that came too. We were blessed to raise two more warriors for heaven. Now I sit here, listening to Riley snoring and Hailey whispering in her bed, I think of my husband and our love that has remained steadfast through it all. I think of my large kitchen table lovingly made by friends with room for children to come, and others too, who come for comfort or fellowship. What more could I ask for? In a friend's bathroom yesterday I saw a sign that read, "Life is not measured by how many breaths you take but by the moments that take your breath away." We have learned to treasure those little moments so much more and to cherish each other more. There is NOTHING in life any more that is worth our wasting even 15 minutes being cross with each other. And not just to cherish those "little moments" with our children but to MAKE MORE of them. And so my friend, when you've dried your tears, I hope I've given you a glimpse not just into our lives, but of our Heavenly Father who is always there, just waiting for you to seek Him. I hope you'll have a good long talk with Him tonight. I hope you'll speak a little sweeter to your husband or wife, and tomorrow I hope you'll "waste" some time making mud pies or what ever else your kids think up. If you ever want to contact us to ask about losing babies, adopting or anything else, please use the link or leave a comment. We'd love to hear from you.